Friday August 30 1907 I got up in good time and got on finely with my work. I had my dinner nearly ready when the ladies came at 11.37. There was Mrs. A.E. Swisher, Mrs. Koontz, Dyan Ballard, Cochran. Dr Smith Mrs Charles & Warren [Pratt?] Mrs Robinson and Mother, Hattie & Fannie. We had a very pleasant visit. They relished my dinner too. It turned warm in afternoon The ladies from town went home at 4.37. Mrs Robinson soon after. I washed part of the dishes before I got supper for Billy and I then I finished the wash. Billy plowed today. 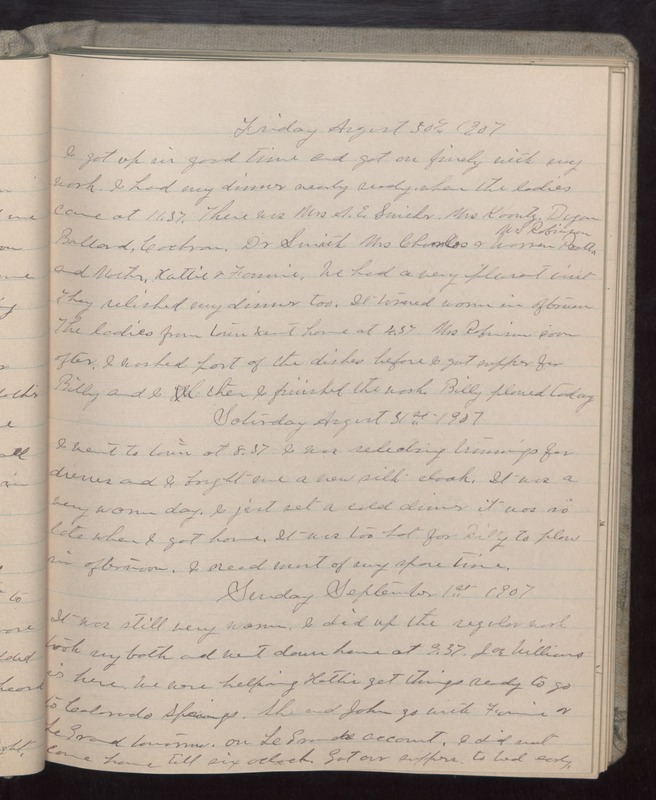 Saturday August 31st 1907 I went to town at 8.37 I was selecting trimmings for dresses and I bought me a new silk cloak. It was so late when I got home. It was too hot for Billy to plow in afternoon. I read most of my spare time. Sunday September 1st 1907 It was still very warm. I did up the regular work took my bath and went down home at 9.37. Joe Williams is here. We were helping Hattie get things ready to go to Colorado Springs. She and John go with Fannie & LeGrand tomorrow on LeGrands account. I did not come home till six oclock. Got our suppers. to bed early.